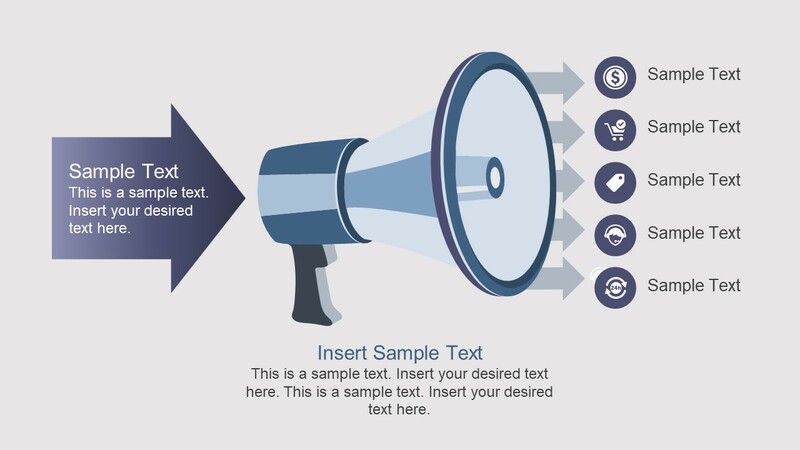 The Free Bullhorn PowerPoint Diagram are the megaphone slides to present several business concepts. In the bullhorn PowerPoint, the megaphone illustrates the business announcement template idea. Therefore, this PowerPoint is ideal marketing and advertising tool to convey an open message to people. Although the free slides show a megaphone shape of PowerPoint. The bullhorn is also a commonly used term for the speaking trumpet to amplify a person’s voice. Therefore, the free presentation template of bullhorn PowerPoint diagram is helpful for demonstrating the announcements. For example, the process diagram or model for large group of people. The free diagram templates of bullhorn PowerPoint show two distinct designs for four and five step slides. 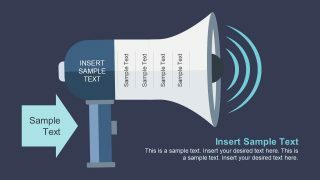 A two slide Free Bullhorn PowerPoint Diagram has blue gray color theme for megaphone clipart shapes. This template diagram illustrates an interesting business end of a bullhorn concept. It demonstrates the idea of when operations are producing effective outcomes, they are making sound. Further, the free template for PowerPoint of megaphone contains interesting infographics and arrow shape and bull horn clipart. These assists the users to present various terms using graphic content as visual aid. These infographics include, dollar symbol, shopping cart, price tag, user silhouette, 24-hour cycle icon. These icons give the immediate idea of presenting a product or customer journey concept of sales and marketing. However, the users can certainly replace these icons to present other business diagram topics. The free PowerPoint diagram of bullhorn is an effective communication management presentation template. The free bullhorn template is tool to display variety of situation where loudly delivering a message is required. The incredible clipart megaphone in free diagram templates of bullhorn have set of shapes join to create an impressive layout. Furthermore, these shapes are high resolution images for rescaling to any level without affecting its quality. The 100% editable template for free users to personalize the diagrams according to the main presentation’s theme. For additional presentation templates, you can become one of our members and get access to over 20,000 PowerPoint templates and slide designs.